This Deluxe B&H Kit consists of a Manfrotto MT190CXPRO3 Carbon Fiber Tripod with a MHXPRO-BHQ2 XPRO Ball Head. 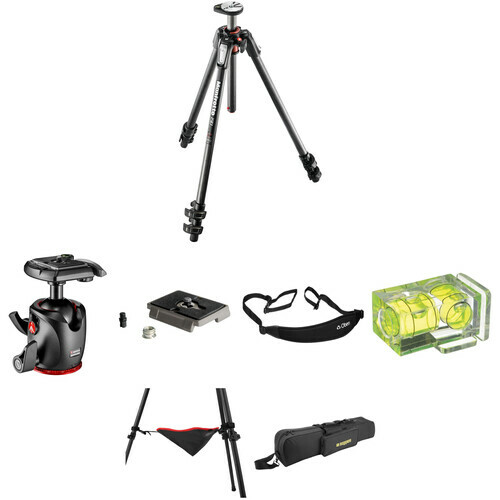 Also included in the kit are an extra quick release plate, a tripod strap, tripod case, bubble level, and a stone bag. These accessories will both help protect your tripod, and make it easier to capture quality images. Holding up to 15.4 lb of gear, and with a maximum height of 67.5" the tripod features a Quick Power Lock System that allows you to completely extend the tripod legs with just one hand. Once set up you can use the MT190CXPRO3's rapid center column in standard vertical mode or swing it into horizontal position like a boom with Manfrotto's 90° column feature. Enlarged tabs on the individual leg angle selectors allow you to get down low for macro work with the column in horizontal mode. And once you're down there you can attach any of Manfrotto's flexible or articulated arms to hold lights or reflectors via the Easy Link plug built into the tripod's spider. The included MHXPRO-BHQ2 XPRO Ball Head with 200PL Quick Release System is strong enough for most applications and ideally suited for the MT190CXPRO3. The XPRO head lets you fine-tune your adjustments, thanks to separate knobs for both the ball and the 360° panning as well as a friction control knob for more exacting placement. The 200PL quick release clamp and plate allow for quick camera attachment and removal, and two bubble levels let you adjust your camera so the horizon is level. A numbered scale around the base of the head makes repeating exact pans an easy task. This kit also provides an extra quick release plate.